On this Cow Creek bank protection project not a lot has visibly changed, but that is a good thing since the Family Home at top of bank is still safe and the streambank is looking very secure. The systemic problem for Cow Creek is it is “incised” and “entrenched”. The term entrenched means that the stream channel has downcut. When it has downcut enough that all flow regimes are carried between the banks, like a big pipe, then we say it is entrenched. In geomorphology we classify the downcut channel as ‘degraded’. Conversely, a channel that is choked with gravels and cobbles, appears concave up, and shows widening tendencies would be termed ‘aggraded’. At one time, in the past, high-energy Cow Creek flows would rise until the floodwaters went out over the floodplain. Imagine something like an audible sigh of relief as the flood spread out, the raging stream power lessened, and the floodwaters enriched the ranch and farmland with new sediment. Flood flows are generally low energy and “depositional”. Over the last several decades, degraded stream channels that are incised are becoming the norm for watersheds experiencing “urbanization”. It is easy to visualize how an urban area, would send more and more runoff into the urban streams as more and more impervious surfacesm parking lots, roads, roofs, gutters, driveways etc. are built. These important modes of infrastructure development are problematic in they prevent natural infiltration and thereby increase runoff. It is insidious because increased runoff causes more flooding, which requires more pipes, and “channelization” which leads to more stream degradation. The increased runoff to urban streams, over the last 50-years especially, has led to the streams downcutting in order to carry the increased urban generated runoff. 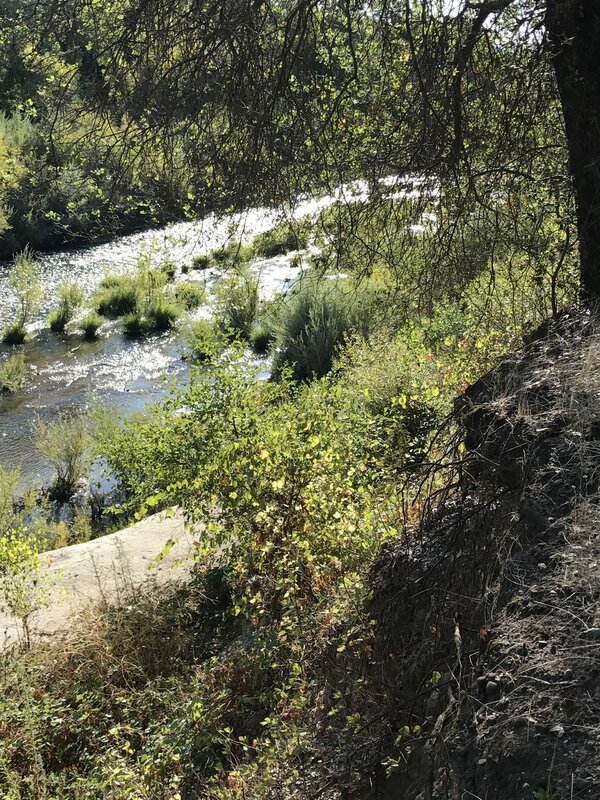 But wait, you might ask, Cow Creek and Stillwater Creek, and similar streams like Red Bank Creek and Reed Creek in Red Bluff are not what we’d call urbanized. Why are they becoming incised? Well, urbanization is just one land use that results in more runoff than historically flowed. What is another land use that reduces infiltration rates and causes large-scale increases in runoff? A tough cookie to swallow is that ranching, especially ranching that involves intensive grazing over 100-years or more. That ranchland in western Tehama that has such incised channels, downcut over 30’, were, according to local natural historians, intensely grazed by sheep for over 50 years before the cattle ranching took off in 1890s. You have all heard of a sheep’s-foot compactor used in construction right, well imagine 150 plus years of intensive grazing the deep rooted native grasses indigenous to the areas meanwhile sheep’s feet were effectively compacting soils. According to the late Dave Dubois, Shasta College NR instructor and natural historian, Western Tehama and Eastern Shasta County was covered with Purple needlegrass, a perennial CA native grass that had roots over 6-ft deep and the individual plant could live 80 years! However, these native grasses didn’t survive the long term grazing, and they disappeared along with the symbiotic mycorrhizae fungi that helped them survive hot dry summers characterized by 7 months with no rain. This rangeland in Tehama and Shasta Counties has now been taken over by annual grasses. The most important message with regards to incised streams is this. Incised streams are a symptom of anthropogenic land use that increases runoff. Historically, rangeland covered with deeply-rooted native grasses probably infiltrated all the rainfall received. Infiltration rates of 2-4” / hr. were probably easily achieved. Because the roots were so deep, the soil could hold lots of water. Now the land, covered in annual grasses, with 2”-deep roots, and soil that has a compacted layer at about 8” deep (referred to as the “cowpan”), cannot accept the rainfall received. Over 80-90% turns into surface runoff, gullies run directly into the streams, and the streams begin to become incised and entrenched. Once the stream flow cannot “go out of bank” and flood, then the incision and channel bank erosion will continue to threaten property and homesteads. It is an insidious process which is in a negative feedback loop. 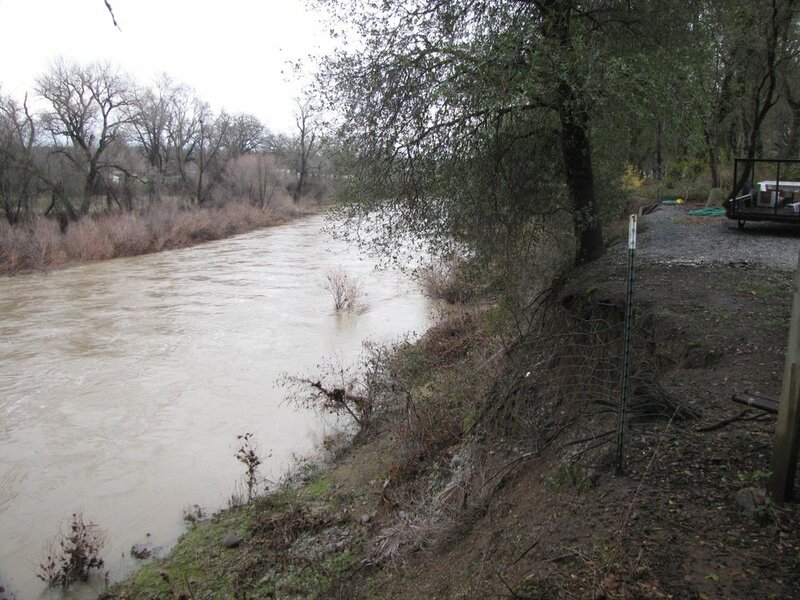 The challenge along Cow Creek is not really flooding but what happens if your house and property is perched on these high banks that are failing by gravity and bank erosion – how do you stop the bank erosion? So imagine our site with the family home up on the high bank. The bank is over-steep, so periodically it fails, sometimes by erosion and often by gravity. The trees and shrubs existing on that bank are really holding the bank up. That “failed” bank is not so over steepened now since the failed bank material “caught” at the toe of the slope. But the next high flows washed that away. Understanding that failure by erosion and gravity, followed by that material (talus) being washed away in high water cycles helped us develop a plan. There are a couple of approaches to protecting your streambank from erosion. But first, when dealing with an incised stream system we have to determine if the downcutting has ceased. The stream was cut down to bedrock. In fact most of Cow Creek in this entire reach has bedrock exposed over 90%. Even though the bedrock isn’t real hard, it is a sand/silt stone; it is a good indicator that rapid incision has been arrested. What if a practioners chose a many – thousands dollar remedy only to “have the bottom” fall out because the stream wasn’t done going down. An obvious design choice would be riprap. But laying rip rap in the traditional way would require removing most or all the vegetation on the bank. That vegetation is the long-term anchoring solution. Rip rap, also called Rock Slope Protection (RSP), places rock armor on the bank of sufficient size and thickness to halt any failure of the bank in question, The property is about 300 ft long and riprap would run about $70,000 just for rock and delivery. Permitting, especially in our local salmon and steelhead streams, is getting pretty expensive. It is unknown but doubtful that the Resource Agencies would even permit RSP! A couple of years ago I was consulting with the local office of the US Army Corp of Engineers about another similar and local stream. I was given a guidebook and encouraged that “this is what we are looking for. 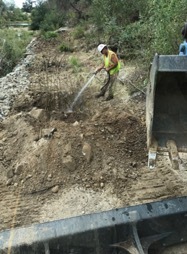 The booklet was published by FEMA, entitled Engineering With Nature – Alternative Techniques to Riprap Bank Stabilization, so I’m assuming that permitting RSP streambank stabilization jobs in critical habitat streams wil be a challenge. It is interesting that Transportation Research Board, addressing a problem posed by the member State DOTs as to “Are there alternatives to Riprap”? Eventually the request was made into a research project, administered by National Academy of Science and my firm was awarded the 3 year research. We documented over 40 techniques and methods that were determined to be Environmentally-Sensitive for Channels and Banks. That report was published in 2005 and entitled NCHRP Report 544 – Environmentally Sensitive Channel and Bank Protection Methods. Salix Applied Earthcare was granted the authorship and we also distribute the report online, with AutoCad drawings, as ESenSS. When anadramous fish habitat is present the permits will require State, Federal, and Local involvement. My experience over the last few years, doing projects, most small in scale and designed to “restore stream function and improve aquatic habitat” have required and effort in “Permitting” that amounts to well over $30,000 or $40,000. The rock riprap and delivery alone for this job would run about $70,000. Construction then is usually 2X material cost so conservatively $130,000 for construction costs. Now the total for RSP or Riprap Bank Protection is estimated at $240,000. This price is in the ballpark with nationwide averages of riprap protection at $100 to $300 per linear foot of bank. In this case the 300’ of property would be in the neighborhood of $300K. 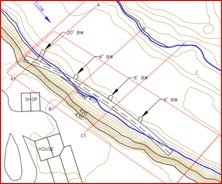 Our published NCHRP Report 544 – Environmentally Sensitive Channel and Bank Protection Methods documented that the Biotechnical (using engineering components and biologic components in a mutually-reinforcing manner) Methods studied in our research had real costs of about ½ to 1/3 of cost of riprap. The cost comparisons were done regionally knowing that rock in Mississippi might have a different cost than California. But a 12’-high RSP job in Mississippi was 1/3 the cost compared to an Environmentally Sensitive job in Mississippi. When you are in an incised stream reach you generally have extremely high stream energy. 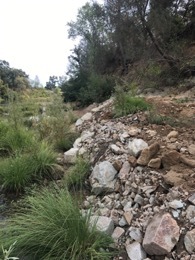 When you install riprap along an embankment, that high energy simple gets transferred downstream, maybe to the next landowner and so on. One thing that reduces energy or absorbs excess energy is “stream roughness”. Establishing lots or riparian vegetation, endemic to the area and adapted to the site is a fundamental way to add roughness. This is actually the approach described in the Engineering with Nature booklet. It gave many case studies where natural materials, large woody debris, root wads, bioengineering with native plants, and engineered logjams etc. have had success. These materials are natures way of ‘adding roughness”. 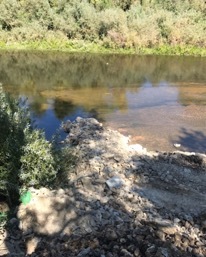 The Engineering With Nature booklet goes on and states that; “when riprap is the primary or only form of riverbank stabilization measure, the end result is typically a uniform, smooth channel, with no complexity.” This lack of complexity leads to high velocities through the protected reach, no refugia, no place for aquatic organisms to propagate, and no shade or cover. This site, pre-construction, had a lot of vegetative cover on the bank and along the creek fringe. Willows, oaks, Ceanothus, button willow, cottonwood and Oregon ash all existed. The best design then would be one that preserved the existing plant materials. 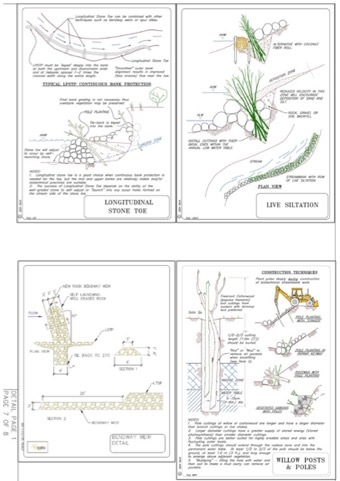 We also needed a design that would help “catch and trap” any gravity-type sloughed material from the upper embankment. The site had an existing terrace comprised of sandstone bedrock about 6-ft wide, dipping from the toe of slope to the ordinary high water (OHW) fringe. 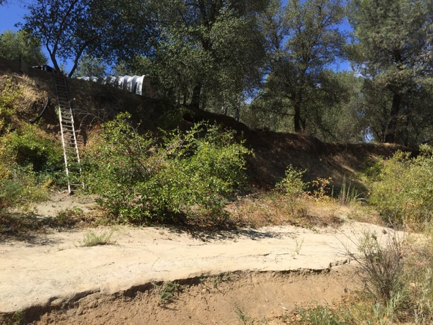 Much of the existing willow shrubs were established along the fringe where that ledge stepped off to low flow water elevation. We decided to use a 4’-high longitudinal stone toe (LST) along that step. The stone toe was carefully placed up to, against, and around the existing willow. We worked carefully and with intention. The bedrock terrace was modified to become a low-flood terrace. Flood terraces are another way to dissipate high energy. The flood terrace was covered with 12”-16” native run cobble, angular rock and then planted (constructed) on the way with out with a technique I call Live Eyebrows, originated by David Polster, from Canada that he calls Live Gravel Staking. 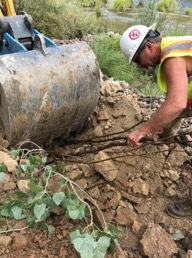 These willow (live siltation) structures are built by dipping the excavator bucket deep into the flood terrace or gravel bar, forming and holding open a slit long enough for a worker to slide in some 3’-long cuttings, then carefully pulling out the bucket will close the slit. 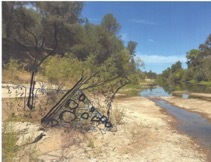 The roughness developed is intended to ‘grow the gravel bar upward’. We desired the fast, high-energy flows directed away from the flood terrace and the toe of the high bank so we installed a designed Bendway Weir at the upstream extent of the property. 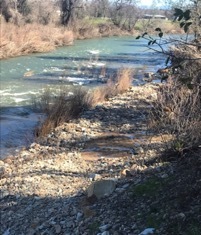 We agreed with our CA Fish and Wildlife Permit to only building the Bendway Weir so it protruded less than 1/3 the Bankfull Discharge Elevation width. As built, the Bendway angled upstream about 15-degrees and will redirect the thalweg (or line or location of highest stream energy) away from the bank and our terrace. Three other short, 8-ft long Bendway weirs were installed to manage the thalweg. See Fig. 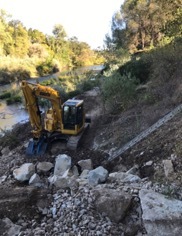 6 The upstream key for our LST and the tieback for our Bendway Weir was also a large rock ramp that we used to get the excavator down the steep bank. This ramp structure will ensure that high-energy flows never get behind or structures. The rest of the design involved building the LST as conceptualized in Fig. 4. 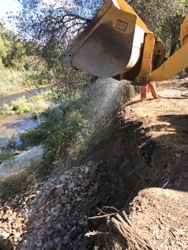 The use of clean, angular, self adjusting rock gradations allowed us to place rock around the existing willows when necessary and also the self-adjusting rock precluded us having to damage the existing stream bottom. 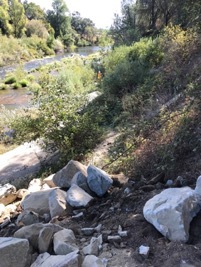 By comparison riprap using standard Caltrans rock specifications, would require a 3-6ft deep keyway cut into the natural stream bottom. The only other construction feature on this project was the extensive incorporation of vegetative – biotechnical elements. The willows and transplants are an important part of the design, so rock placement and bioengineering are dome simultaneously – the vegetation elements are not left as the afterthought. Most importantly this project mimicked nature and tried to mimic how a natural healthy stream would function, dissipate energy, and pass water and sediment during high flows. 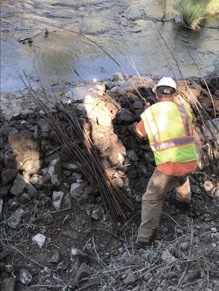 It is my hope that the cost, both in time and money, of acquiring permits for Stream Protection jobs that are demonstrably designed to restore stream function will become less expensive. As regulators become more and more familiar with these elements maybe a few more green lights will be given. Like the TSA Pre check, maybe some of us, doing environmentally-sensitive work will be allowed to keep our shoes on during screening. 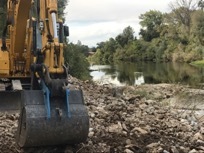 And then that may inspire others to go out and learn how to do jobs that not only protect streambanks and rivers, but also actually improve aquatic and riparian habitat. Fig. 2 Access to the work area at toe was a challenge. Fig. 6 First draft of the plan view. Permitting required several iterations and explanations. 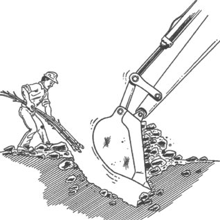 These environmentally-sensitive techniques, such as using well-graded clean stone that self-adjusts and therefore doesn’t require scour trench, is new to this area. Fig. 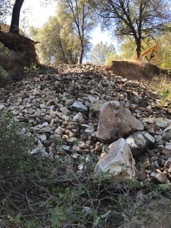 8 Over 500T of clean, angular, well-graded, poorly sorted, self adjusting rock, as per NCHRP Report, were used. All rock was delivered to cliff by loader while it was cleaned again. Fig. 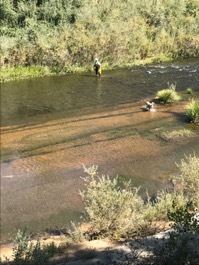 9 This critical salmonid area was protected by water quality standards (1 NTU increase allowable for short period only), seasonal protection of songbirds, and protection and avoidance of flowing water areas. A biologist was required to inspect the work. Fig. 10 The rock was down the cliff but how to get the excavator down was next problem. Must also consider, how to get it back out upon completion!! Fig. 12 Live Siltation and Live Eyebrows are revegetation techniques which cause localized “roughness” – The high stream flow will dissipate energy on the willows instead of “eating” the bank !! Fig. 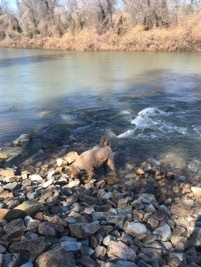 13 Looking at and managing stream energy is like having a high energy dog. If I don’t toss Bear a stick or rock, he will soon be eating my socks. So ask yourself, have you given your stream willow shrubs, LWD, or gravel to pick up and transport? Is roughness available? Fig. 15 This project afforded 300-LF bank protection in an environmentally-sensitive way. Ultimately, by intentionally restoring stream function, we were able to design, permit and build at about 1/3 the cost of riprap. This finding is consistent with ESenSS. Note upstream-angled Bendway Weir. The BW will be under water during high flows but redirect the flows, like an airfoil, toward the center of channel. Fig. 16 The same flood terrace view taken in March 12, 2019. This terrace had been under water, experiencing about 6-8 fps, for the last three weeks. Fig. 19 Here is the upstream Bendway Weir in 2017. Fig. 20 This photo, taken March 2019, after 16 months, show the Bend Way is still functioning! And Bear is dissipating his energy on a stone!